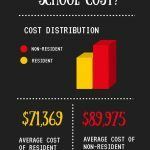 It goes without saying, PA school is expensive. PA school is also demanding, which means you will have limited time (if any) to work while attending school. With the average undergraduate education debt prior to PA school at $36,300 and the average anticipated debt load from PA school at $75,000-$124,000, it is important that you have a rock-solid plan for how you are going to pay for your PA school education. Funding sources vary and federal loan programs will probably form the foundation of your assistance package, many states also offer financial aid funding. Additionally, there are specialized scholarships, traineeships, and loan programs available. Remember — apply the resources for scholarships and grants before you accept loans. Then, only accept loans that you need. Work closely with your financial aid department. They will be able to inform you about special loans and scholarships for which you may be eligible. Numerous loans and grants guaranteed by the federal government are available to qualified students. Visit the website for Federal Student Aid sponsored by the U.S. Department of Education. Federal Stafford Student Loan Program: These loans are offered through your bank, credit union, or other lending institutions. Graduate students may borrow up to $8,500 per year up to a total of $65,000. To qualify for a Stafford loan, you must demonstrate financial need as determined by the CM formula mentioned above. The interest rate varies. These loans are based on need, not creditworthiness. Therefore, no cosigner is necessary. State sources of financial assistance include an agency in each state that guarantees federal student loans. Also, some states offer their own educational assistance programs with loans or grants. Check with your financial aid office to locate the office(s) in your home state. Tax Credits are another option to explore. Americorps is a national network of hundreds of programs throughout the U.S. and is open to U.S. citizens, nationals, or lawful permanent residents aged 17 or older. This program helps pay for education in exchange for a year of service. The Indian Health Service (IHS) Scholarship program provides financial assistance for American Indian and Alaskan Native (federally recognized only) students enrolled in health professions and allied health professions programs. The IHS Loan Repayment Program (LRP) was created to support this mission by providing health professionals the financial freedom to fulfill your career goals. The IHS LRP awards up to $20,000 per year for the repayment of your qualified student loans in exchange for an initial two-year service obligation to practice full time at an Indian health program site. The National Health Service Corps Program (NHSC) is a competitive federal program. 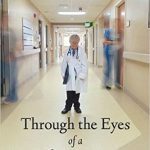 Students dedicated to practicing primary care in communities of greatest need can compete for educational scholarships. I was an NHSC Scholar and you can read more about that here. They also offer a generous loan repayment program in exchange for 2 years service in a designated healthcare shortage area (see the next section below). The Physician Assistant Foundation offers competitive scholarships for PA students who are currently attending an accredited PA program, are in the professional phase of the program and are student members of AAPA. Visit the Foundation web pages for a current application or see below. The United States Navy Health Services Collegiate Program is designed to provide financial incentives for college students in designated health care professions while completing baccalaureate degree requirements. 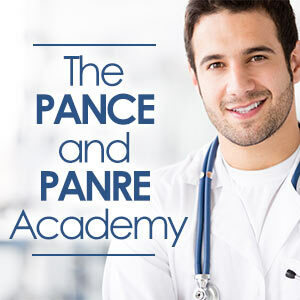 The U.S. Army Health Care team offers a three-year loan repayment program for any PA- C who wants to serve as an Army PA.
PAs for Latino Health (PALH), a Caucus of the AAPA, offers a $500 scholarship to currently enrolled PA students each year. The Tennessee Physician Assistant Foundation awards the following scholarships each year at FallFest, TAPA’s fall continuing medical education (CME) conference. The National Health Service Corps (NHSC) Loan Repayment Program is available to PAs in primary care or current students who plan to become primary care providers after graduation. You must agree to provide primary care services in a priority health professional shortage area for a minimum of two years. Public Service Loan Forgiveness Program: The Public Service Loan Forgiveness (PSLF) Program forgives the remaining balance on your Direct Loans after you have made 120 qualifying monthly payments under a qualifying repayment plan while working full-time for a qualifying employer. 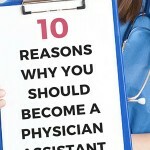 Physician assistants qualify. IMPORTANT: Loan forgiveness is an option after 10 years of payments, but it may not be an option if you refinance your loan during that period. So make sure you read the fine print! Sallie Mae Tuition Pay Plans provide quality, low-cost, innovative solutions to paying for education. Tuition Pay is an interest-free plan that lets you break down the large lump-sum payments due at the beginning of each semester into easy-to-manage installments. Common Bond: Ever wished your student loans could have a positive effect on society? Common Bond seeks to "reimagine finance based on our belief that business has a responsibility to further social good and promote welfare outside of its immediate customer base." Common Bond is unique in that they bring a 1-for-1 model to education through Social Promise. For every fully funded degree on the CommonBond platform, they fund the education of a student in need for one year through the nonprofit Pencils of Promise. They even fund a trip to Ghana with Pencils of Promise so that borrowers (and employees) can go and meet some of the children who the Social Promise has helped to fund. Insider's tip: Looking to refinance a loan? 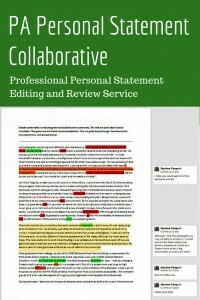 Magnify Money is a wonderful website that lets you compare and contrast student loan options. Just beware that if you have federal loans, refinancing to private loans may result in losing protections like special repayment plans (such as the public loan forgiveness program) that can help you in a time of need. Make sure you can comfortably afford your new payments if you refinance. And take the time to get rates from several providers. The Physician Assistant Foundation offers competitive scholarships for PA students who are currently attending an accredited PA program, are in the professional phase of the program and are student members of AAPA. Visit the Foundation website for a current application. Here are some of their current offerings. The 16 PA students who were awarded scholarships during the 2016 application cycle are listed here. Open to all applicants who meet the general eligibility criteria listed above. Awarded to students who demonstrate service leadership through their PA program or through a community health organization/project. Awarded to underrepresented minority students and/or those who are economically and/or educationally disadvantaged (see definitions of these criteria here). Awarded to students from a rural area who are committed to serving a rural community. Awarded to a Florida-based student who is a veteran or the child/dependent of a veteran. 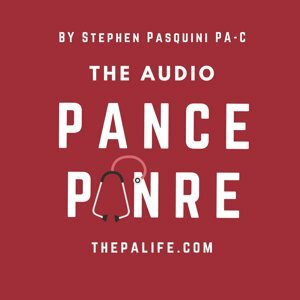 Named in memory of Ron Pace, a Florida Academy of Physician Assistants past president and AAPA Outstanding PA of the Year Award recipient, who served in the U.S. Navy for 20 years. 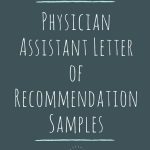 Association of Physician Assistants in Oncology offers a $2,500 award for PA students. The award consists of two parts: $500 to help with travel to AAPA's Annual Conference to receive the award and $2,000 (unrestricted). Apply by March 1st. California Academy of Physician Assistants offers three annual student scholarships for student members. Apply online by December 31. Lesbian, Bisexual, and Gay Physician Assistant Caucus offer $1,000 grants for two PA students to attend AAPA's Annual Conference to help foster involvement and awareness of the caucus within the AAPA. Apply by January 15. 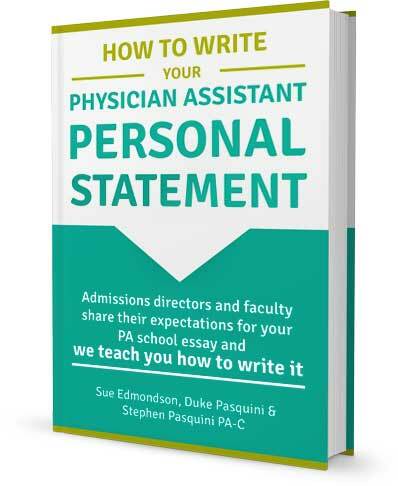 Pennsylvania Society of Physician Assistants has six annual student leadership scholarships and three scholarships for students who choose to enter the writing competition. Apply online by June 30. 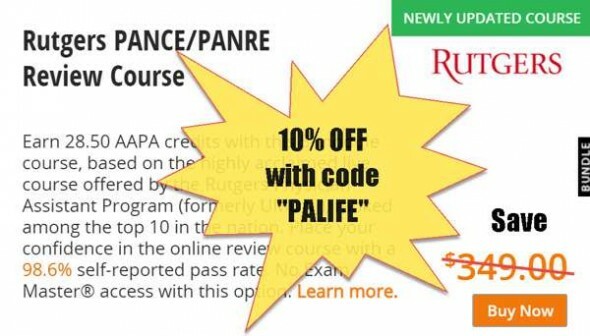 Physician Assistant Academy of Vermont offers a scholarship of $1,000 and free attendance at the annual PAAV Winter CME Conference for PA students who are residents of Vermont. Apply by June 30. 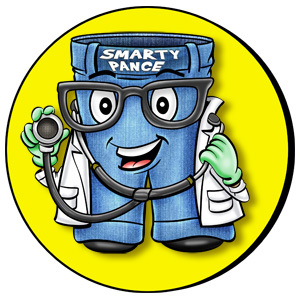 Physician Assistants in Orthopedic Surgery offers one or two $500 scholarships from the Susan Lindahl Memorial Scholarship Fund, established to encourage young PA students to enter the field of orthopedics. Apply by August 15. The Society of Army Physician Assistants honors the memory of Captain Sean P. Grimes, through the Captain Sean P. Grimes Physician Assistant Educational Scholarship Award. Apply by February 1st. The AAPA Veterans Caucus Scholarship seeks to recognize the achievements of an outstanding veteran of one of the seven branches of the Uniformed Services who is currently enrolled in a PA program. Note: Grants are similar to scholarships, and availability is based on resources and financial need. When you submit your FAFSA form, you will be considered for Pell Grants. Also, check your place of employment, organizations, and place of worship for any grants for which you may be eligible. Description: This award recognizes three student societies for their outstanding service to the profession. Additional details: All of these student societies documented their work in the following categories: public education and advocacy of the profession, public service, and outreach, promotion of the diversity and professional involvement. Seventy-five percent membership is required to participate in this award. Description: A $500 grant for AOR student society representatives and Student Academy selected HOD student delegates or alternates to minimize travel expenses to the annual conference. Description: This award recognizes a PA who has demonstrated exemplary service to PA students and has furthered the leadership, educational, and professional development of PA students. 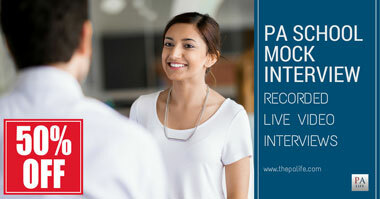 Description: This award honors a PA student who has demonstrated exemplary service as a PA student. If you have any questions about these scholarships and grants, you can contact the Student Academy Staff at the following email address: students@aapa.org. 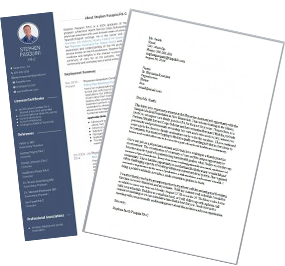 General qualifications may vary depending upon whether you intend to serve Active Duty or Reserve Duty and whether you are currently serving, have served before or have never served before. Who Gets the Most Financial Aid? You might think that the families who receive the most financial aid would be the families with the most need. In fact, this is not necessarily true. The people who receive the most aid are the people who best understand the aid process. 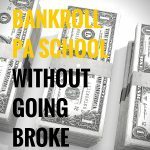 Can I afford Not To Go To PA School? 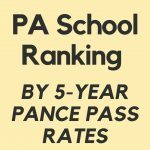 Can I afford to go to PA school? 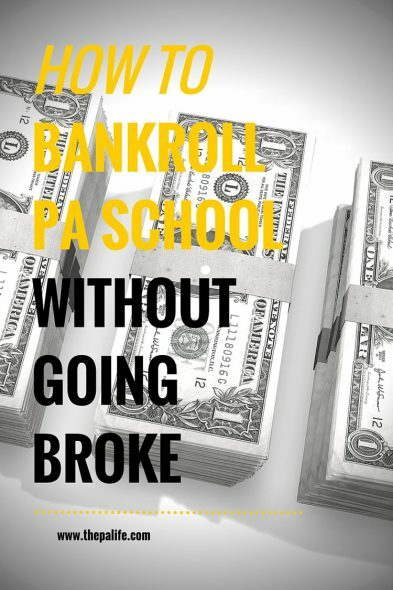 The question you should be asking is: can I afford not to go to PA school? 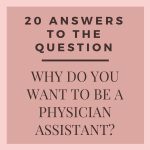 If your goal is to become a PA, then the answer to this question is easy. The worst thing you can do is shy away from applying because you think you won’t be able to afford it, and then live the rest of your life wondering, What if? 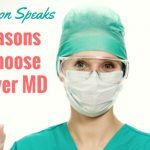 When I applied to the Rutgers Physician Assistant Program and spoke with students at the open house, they explained that if I were to be accepted the program would do its best to ensure I got through financially. They were right. I may have borrowed a little more than I intended, but the money was available and after an initial setback I ended up with a highly coveted NHSC Scholarship. As you will soon find out, there are plenty of opportunities for loans, grants, scholarships, etc. It does, however, take a little work on your part. But since you have set your goals and you’re focused, you are prepared for anything. Bonus: The Today Show recently had a very good program about loan refinancing and avoiding debt. Take a look at the video here and review their 7 ways to stop loans from ruining your life. 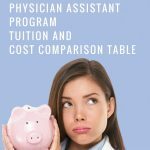 Previous Post: « How Much Does it Cost to go to Physician Assistant (PA) School? I’m an honors student at UMD. I am graduating next month. I have several clinical credits. 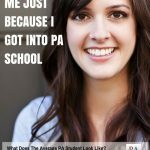 What are the best steps to be accepted into a PA school. I am looking to become a NHSC scholar as I am already interested in community medicine. I am going to apply in the 2019 cycle. 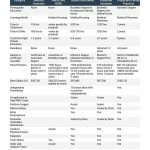 Would I need to apply for NHSC while applying for schools, once I commit to a specific PA school, or after I graduate PA school? I am an international student in the process of applying. 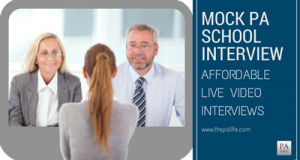 What may the steps to get loans/grants or scholarships/assistantship to pay for PA school – tuition and accommodations after I am accepted? Hi! Thank you for the helpful article. I am interviewing for schools currently and I have read everywhere that there is a big push for PAs interested in entering psychiatric medicine, which is my field of interest. Do you know of any scholarship opportunities in this specialty? Thanks! Hi Jess, the only way to understand what we do on a day to day basis is to observe us in action. 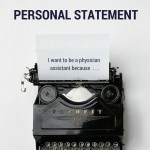 You say you are interested in being a psychiatric PA? Then my advice is to go out there and find one to talk to and ideally shadow. 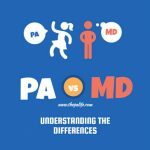 Consider also observing a PA in their more “natural” habitat as well such as in the ER or a family practice clinical setting. This way you can get a good feel for what our role is as a generalist. I don’t mind at all, the stipend I received in 2004 was $1000 per month. I sure would hope that it has increased since that time! Hi Stephen! I have 2 young children, am already 38 and also a military Veteran. I want to be a PA so I can give back and work for the VA to help with veteran women’s healthcare. How difficult would it be to attend the grad program without getting a job while in school? Not bad at all… It is 26 months of intensive study and there are many programs out there that will help with loan repayment. The VA is in desperate need of people like you to join their ranks! I say go for it! There are various programs that offer loan forgiveness or partial repayment in exchange for commitment to working in a certain underserved community or area for a set time. Can you comment on these? I think these are wonderful programs! As a National Health Service Corps scholar I was “required” to serve just 2 years in an underserved community in exchange for tuition and a monthly stipend. I stayed at my service corps site for 10 years so I guessed it worked out well. I love these programs and I recommend them to everyone who has a passion to serve in these types of communities. It is a wonderful experience and I am now fluent in Spanish as a result. Hi! am a Ghanaian and I want to know how I can go to the PA school for free? 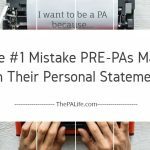 You may want to check that out, especially if you plan on returning home to work – as PAs are not recognized in many countries, even in South Africa this is a very new profession. If you are working, living and studying in the United States you can speak with someone at your financial aid department of your college/university and an academic advisor – they are a wonderful resource. If you are in Ghana, a good place to start may be a local University there and speak with someone in their international studies department or call your local government representative/agency. The applicant must be a student in good standing enrolled in a Committee on the Accreditation of Allied Health Education Programs (CAAHEP) approved program in Tennessee, or a student in a CAAHEP approved program outside the state of Tennessee who holds valid residency in the state of Tennessee; accepted proof will be valid driver’s license from Tennessee or other authenticated legal document. Applicants of the James Montag, Jr. scholarship must have military experience. Thank you so much Kate for posting this! I will try to remember to add this to the post and I encourage everyone with scholarship or grant opportunities not listed above to post them here in the comments section.